Former New Yorker editor Kiernan (Seeing Mary Plain, 2000) pussyfoots around the life of New York philanthropist, society lady and writer Brooke Astor. Reading this cautious bio of her tantalizing talents at garnering men, money and causes, it becomes apparent that the beloved grand dame was wily as well as charming in her heyday. (She’s still alive, but frail and secluded at age 105.) The only child of a respectably middle-class career officer, Brooke Russell spent her childhood overseas, roving from Hawaii to China to Washington, D.C., where she attended Miss Madeira’s School. Her mother’s ambition for her reached no higher than marrying a rich man, and by age 16 she was finished with school and faced with a suitor: wealthy Princeton senior Dryden Kuser, who turned out to be alcoholic and abusive. The couple endured ten unhappy years and produced one child, Tony, before Dryden asked for a divorce so he could marry another woman. Brooke soon wed longtime admirer Charles “Buddie” Marshall, a well-connected stockbroker who first had to extricate himself from his own marriage. They lived grandly and happily for 20 years, during which Brooke began work as an editor and writer at House and Garden. After his death in 1952, however, his widow discovered that Buddie’s punitive divorce settlement meant she inherited only a modest income. Not to worry: Within six months, aging moneybags Vincent Astor had proposed, encouraged by his current wife Minnie, who figured she’d get a better divorce settlement from the odious creature if he’d found someone new. 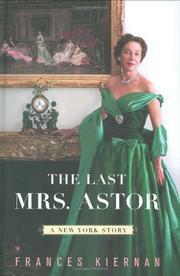 His death in 1959 made Brooke marvelously wealthy and the head of the Vincent Astor Foundation. She became a famous philanthropist in her own right, generously supporting the Bronx Zoo, the Metropolitan Museum of Art and the New York Public Library, among many other venerable institutions. Proficient, but too heavily based on Astor’s own memoir, Footprints (1980), to be terribly revelatory—or interesting.